After having spent the past two days with Starcraft II since its midnight launch, I have to say it’s been an interesting experience. For a lot of you, that might seem a very underwhelming evaluation of the game and I have to say, I was in fact a bit underwhelmed. However, that in no way means that Starcraft II is in any way a sub-par title. There’s a very good reason Blizzard sunk $100 million into this baby and it shows pretty much everywhere you look. Let’s break it down for you though. Blizzard’s always had a strong tradition of pushing the graphics in their games. However, in SCII, you won’t see the best graphics Blizzard has to offer during the RTS portions of the gameplay. No sir, that honor has fallen to the ridiculous in-engine cinematics featured in SCII, cinematics that have become so well-rendered that they are only distinguishable by the lack of anti-aliasing from the full render-farm CG cutscenes that Blizzard mastered with the Warcraft series. Light scatters across various surfaces in very convincing and compelling ways, so that you can see the pits and scuffs in a Terran marine’s armor and the fleshy, wet and ravenous face of a Zerg Hydralisk. The animation quality follows the raw lighting and texturing, bringing these models to life with excellent animation and the two combine to create some of the best in-engine cinemas ever seen. Really, the best comparison to make in this case is to the other giant sci-fi franchise in the industry, Mass Effect, and the comparison is really very close in terms of quality. In terms of the actual gameplay, Starcraft runs more off of its superior art style and unit design rather than any impressive graphical horsepower. However, that is probably what Blizzard went for here since Starcraft’s graphics are supposed to be eminently scalable to fit all sorts of low-to-high end machines. In doing so, they’re able to reach a much wider audience, not to mention that the vast numbers of units on-screen will require more power devoted to each one. Whatever the case, the game looks fantastic on-screen while rendering scenes of bloody combat, and some fun nods are thrown into the units. Some have very particular death sequences, and these can vary depending on the unit used in combat against it. For example, a Terran marine will be riddled with bullets and fall over against most other ranged units, but against a Protoss zealot, the marine can be cut in half and fall over. It’s detail like this that shows how thorough Blizzard was in their presentation and graphical prowess. True to tradition, Starcraft II makes a grand comeback with an epic campaign stretching 26 missions. The story is told not only through those gorgeous in-engine cinematics, they come to you also through an interactive hub, the battlecruiser Hyperion, that will be your hang out in-between missions to talk with characters and get extra bits for story and background. It’s all rendered in that same gorgeous cinematic engine that powers the in-engine cutscenes mentioned earlier. It’s a nifty little mechanic that allows players to absorb bits of story at their leisure. Without giving anything significant away about the storyline, Blizzard has filled this new iteration with characters that are well-fleshed out and are easy to emotionally invest in, deepening player involvement in the universe. Jim Raynor returns as a major player, as well as the Protoss Dark Templar Prelate Zeratul and the Zerg Queen of Blades, Kerrigan, but they’re all backed up by a cast that really adds substance to the universe. Tychus Findlay, the Terran marine well-known to players from the cinematic teaser released in 2009, becomes an old associate of Raynor’s that is an absolute joy to hear due to his wild penchants for destruction that will soon become obvious over the campaign. For those people who love cinematics though, Blizzard continues their tradition of beautiful CG rendered cinematics, depicting only their most action-packed scenarios where the most consistent and polished presentation is necessary. In as far as the gameplay as gone, Blizzard hasn’t messed with the formula. Aside from the upgrade to a full-3D engine and new units, Blizzard has maintained the balance and pacing of the game as close as possible to the original Starcraft. There are some small but critical differences in the user interface however: at least as the Terrans go, build order has been integrated into their behavior routine, meaning that if you order an SCV to build another structure while they’re already on a project, they’ll continue on their current project and only move to construct the other when they’re finished, allowing for a player to establish their build order early on and not have to devote as much attention to base construction as before. Also, the number of units that are selectable at one has been greatly expanded beyond just 12. Now the player can easily select 36 units (or more, I haven’t tested the upper limit) and send them to wreak havoc. Establishing hotkeyed groups is just about as easy as any other RTS as well, just select a group and assign it using the Ctrl-# combination. The campaign itself is a bit of a different beast than multiplayer. It features more units than are available in the multiplayer component of the game, and this is where you will see old favorites come back from Starcraft and Brood War– units like the Goliath and the Medic won’t be featured in multiplayer and are instead supplanted by new units with different mechanics like the Medivac (a Dropship with a medic beam aboard) and the Thor (a new super-heavy mech that hits hard on the ground and air, but moves slow and requires a lot of support cap). That said, these units find themselves fighting side-by-side in the campaign, so you’ll get to play with both. These units will, in game, be affected by choices you make on the Hyperion between missions. This comes in the form of Credits-based unit upgrades and research-based faction upgrades. Completing missions (and certain objectives during certain missions) will earn you Credits for usage on the Hyperion to purchase stat upgrades for your units, such as longer-ranged missiles for your Viking transformable fighters or more health for your ground-based Missile Turrets. Credits also allow you to hire the services of mercenary forces, the contracts issued at the Hyperion between missions. Once in a mission, they get built from the Mercenary Compound structure, usually included as part of a starting Terran base in the campaign. While a bit pricey in terms of in-game minerals and vespene, mercenaries are built instantly in squads and are hardier and more powerful than their mundane brethren (plus they come with unique models so that’s nifty), so they’re being pretty good for getting an immediate boost in firepower to punch your way through a Protoss defense or for an emergency defense against a Zerg swarm. When you’ve finished the campaign and gone through the initial serving of multiplayer maps, there’s still the powerful Starcraft II Map Editor included to mess around with. Granted, using the editor’s more powerful functions requires some knowledge of coding, but it represents an opportunity for avid players and members of the community to build their own content for the game and flood Battle.net with it. First and foremost, Blizzard, by doing this, seems to have simply updated a winning formula and it pays off handsomely for them. The gameplay still remains simple, although the capabilities of the user interface are updated and expanded. 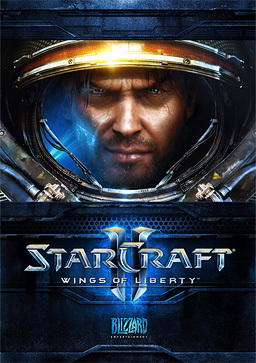 The gameplay definitely remains familiar to longtime veterans of the original Starcraft, and yet still accessible enough to people new to the series, ensuring that the title continues to draw a large audience of both old-timers and new blood. It’s good gameplay, perhaps a little unsophisticated for some people at first glance, perhaps disappointing over the long run, but the fact of the matter is that it has terrific draw and appeals to a great many people. Me personally, I felt like the gameplay lacked a certain amount of depth to it, but then again had a certain amount of depth I could never access given the ridiculous ways I could be stomped online. I don’t know how many of the rest of you seem to be in that magical sweet spot of fail, but it can’t be many given that SC2 has so far moved about 1.5 million units and continues to move in a hurry. Starcraft II… what to say? Everyone loves you so much and yet I fail at your multiplayer. Whatever the case, the massive amounts of capital sunk into its development and that elongated development cycle between World of Warcraft up until now clearly shows some spectacular payoffs here. The graphics are beautiful, the narratives polished, the gameplay classic, and the map editor powerful. You wouldn’t be amiss spending the $60 required to play this. Definitely worth it, whether for the story, the editor, or owning people online. This entry was posted	on Thursday, August 5th, 2010 at 9:45 PM	and is filed under Games, Reviews. You can follow any responses to this entry through the RSS 2.0 feed. You can leave a response, or trackback from your own site. Very nice review. I haven’t played Starcraft II just yet, but that’s only because I some reason didn’t like Starcraft I (uh oh, hopefully fan boys won’t dig me into the ground for that statement!). I’ll get to it though, all in due time.